In 1968, Mercedes-Benz introduced the W 114 (six-cylinder) / W 115 (four/five-cylinder) as successor to the W 110. It is known as Strich 8 (Dash 8) in Germany. Its design is marked by restraint – completely devoid of unnecessary things, except for the chrome side strip. It definitely looks more austere than its tail-finned predecessor, while clearly continuing the design line. The W 114/W 115 was a huge sales success. It was available as four-door saloon, two-door coupe and stretched eight-seat version. I’m a coupe guy, but the Strich 8 coupe looks a bit awkward to me with a boot lid that appears almost as long as the bonnet. There were a number of modifications throughout the production run. The most important update was in 1973, which included the ribbed tail lights that were a standard Mercedes design ingredient for many years to come. A multitude of engines was available. Diesel lovers (read taxi drivers) could choose from the 200D, 220D and eventually 240D, with power ranging from 55 hp to 80 hp for the five-cylinder 240D 3.0. 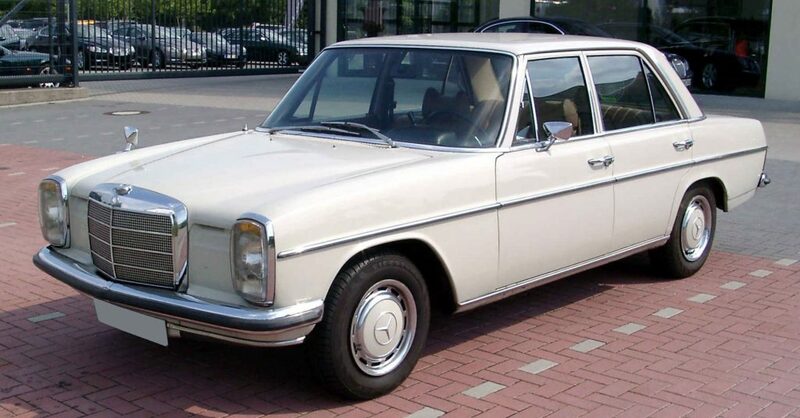 The four-cylinder W 115 was available as 200 (95 hp), 220 (105 hp, until 1973), and 230.4 (110 hp, from 1973). The six-cylinder W 114 had even more engines available, ranging from the 120 hp 230 to the fuel-injected 185 hp 280 E.
Production ended in 1976, a couple of months after the introduction of the W 123. Almost two million cars were produced. I could not find acceleration figures. Wikipedia lists top speeds from 130 kph for the 200D to 200 kph for the 280E. Classic restrained Mercedes-Benz styling. Reliable. Only the sought-after top engines deliver real performance. Coupe looks a bit awkward. Rust is an issue, and the chassis has been called unrepairable due to its complex construction with many hollow spaces. W 114 in a darker color that accentuates the chrome trim. It’s not a car made for driving quickly, so whether it is a 230 or 280E doesn’t really matter to me.